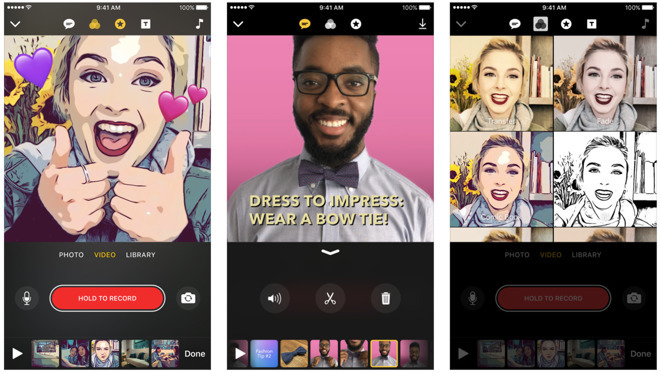 Apple's compact video editing app Clips has debuted and requires iOS 10.3 which in itself runs on 32-bit devices —but the app doesn't run at all on the iPhone 5, iPhone 5c, and iPad 4. Apple's Clips video editing app, announced at the same time as the 2017 9.7-inch iPad, is a more complex video capture application than the existing mechanism in the Photos app. It allows users to capture a video live, apply video filters, overlays, and posters, and rapidly upload the video to assorted social media venues. It is not exactly clear when Apple will completely drop support for 32-bit devices in the iOS itself. The omission of 32-bit device compatibility appears to be another step for the company in that direction. During the beta process, iOS 10.3 changed a warning about 32-bit software slowing down devices. Halfway through the beta release cycle, the warning started telling users that 32-bit software would soon not work at all on iOS. The iOS 10.3 update originally had the ability to update 32-bit hardware "over the air," which was then retracted. Affected devices, including the iPhone 5, iPhone 5c, and iPad 4 were always able to be updated through iTunes, though. The iOS 10.3.1 update restored the "over the air" update capability. However, the iOS 10.3.2 beta, released between the 10.3 and 10.3.1 update currently lacks 32-bit device support and it is unknown at this time if it will return. Clips is a free download from the App Store, and occupies 49.3MB of device storage space, prior to video editing.